I can honestly tell you that I am not a fan of the summer months. I enjoy that work is a little quieter and the days are long, but I will always prefer Fall, Winter, and Spring. Despite spending much of my childhood in the South, I am not made for heat and humidity. This Ice Box cake definitely makes summer more bearable! I came up with the idea for this cake after talking to a co-worker about ice cream cakes. This cake came out even better than I expected. We shared it with our neighbors and after second servings there were no leftovers. This is the perfect way to enjoy a S'more on a hot day without a campfire. Set out your ice cream to soften. Line a loaf pan with plastic wrap so that all sides are completely lined and there is a minimum 3-inch overhang on the longer sides of the pan and set aside. Line a 11x17 sheet pan with parchment paper. Measure out 1 cup of mini marshmallows and set aside. Place the remaining marshmallows on the lined sheet pan and place in broiler. Watch your marshmallows carefully and remove when toasted to a golden brown (or darker if preferred). Each oven will vary so it is important you watch your marshmallows. Set aside. Empty vanilla and chocolate ice creams into two large bowls. Add half of toasted marshmallows into each bowl. Add 2 chopped chocolate bars into each bowl. Stir well until each ice cream is well combined and resembles soft serve ice cream. It is perfectly fine if it is partially melted. Arrange graham crackers so that they completely line the bottom of your pan. Top with half of the chocolate ice cream mixture. Cover with another layer of graham crackers. Add half of the vanilla ice cream mixture. Top with another layer of graham crackers. Repeat chocolate layer, than graham crackers, and finish with vanilla layer. 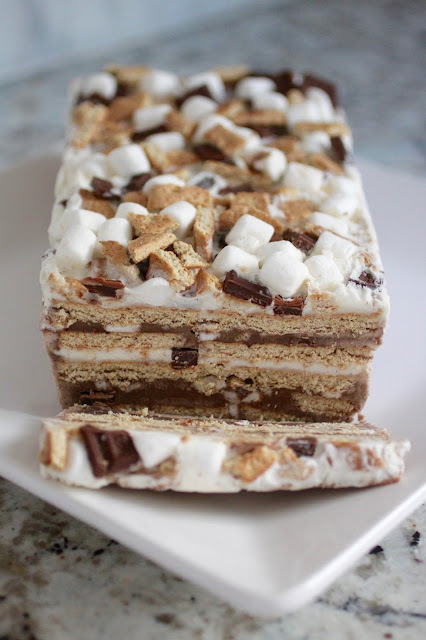 Top cake with reserved marshmallows, chopped chocolate and left over graham crackers broken into pieces. Fold plastic wrap over the top of cake and freeze at least 8 hours.